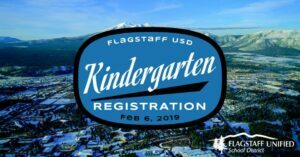 FLAGSTAFF — To assist families with the registration process for the 2019-2020 school year, Flagstaff Unified School District elementary schools will be hosting Kindergarten Registration on February 6th from 4:30 p.m. to 6:30 p.m. at all district elementary schools. Parents are strongly encouraged to pre-register their child for kindergarten as the event helps schools plan for the upcoming year and manage class sizes, staffing requirements, and other resources. To pre-register for kindergarten, all children must turn five years of age on or before August 31, 2019 to be eligible. Parents with children turning five during the month of September may request possible early entrance. On the date of Kindergarten Registration, please bring a birth certificate with you when you register your child for school. Census certificate for Native Americans, a letter from a duly authorized agency having custody (D.E.S. or court appointed guardian), or a reliable medical, religious records or civil/government records (such as a visa) can also be used as an alternative to a birth certificate when appropriate.